The new Virtual Sensitive’s interactive touch roundtable Coconote has added newly installed eyevis-DLP-projectors, which boast improved performance and lower maintenance costs. The round display table with multi-touch system with more than 100 touch points can be used for presentations, simulation, product demonstrations or co-working in showrooms and meeting areas or at trade fair booths and info points. The new eyevis projectors which are integrated into the table construction not only increase the resolution of the display area, but the LED illumination also lowers maintenance costs of the tables. The launch of the new interactive touch-table is planned for September of this year. Additionally, the Coconote will be presented on a joint roadshow of eyevis and Virtual Sensitive in Spain, France and the UK in October and November. 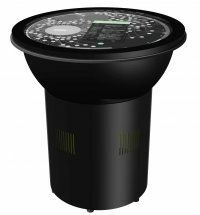 On a circular screen area with 76 cm diameter the Coconote provides access to interactive information. Depending on the application this can range from classic signage applications, over interactive map represantations up to 3D animations of new products. Through the touch system with over 100 touch points and the possibility to run several applications simultaneously, several users are able to access individual information at the same time. The eyevis projectors, OEM versions of the ESP-LHD series with native full-HD resolution of 1.920×1.080 Px increase the richness of detail of the display area to up to 1.200 Px in diameter. The LED-illuminated DLP projectors by eyevis moreover allow for 24/7 operation of the touch tables without having to exchange LEDs within the lifespan of seven years. This lowers service costs of the tables and makes them ideal for info points that are available 24 hours a day.